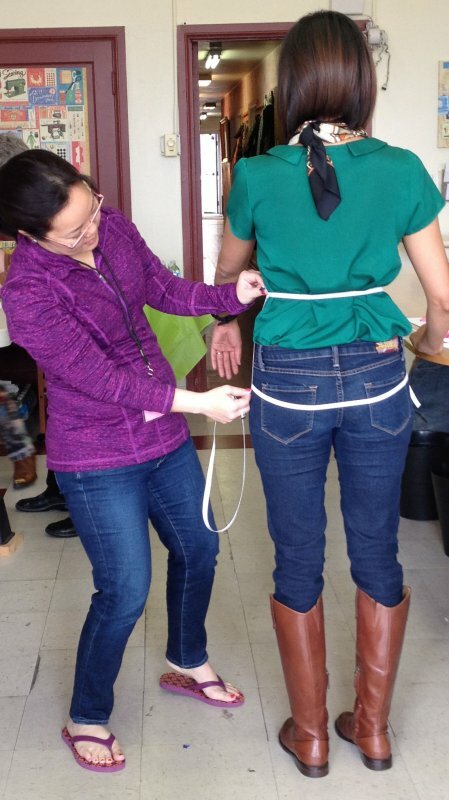 You will make a personal pant draft from your own measurements and construct a muslin. Next, the fit will be checked and adjustments if necessary, will be made. This is a fun packed 2 days and you will leave with a basic pattern you can design from: yoga pants, pleated trousers, jeans, Capri's, shorts, the styles are unlimited. Students call Kenneth a "Genius" and "Brilliant" agree he is the best instructor in his field. A Fitting Clinic with Kenneth will be held on Monday, Feb 15 from 8 am-2 pm. Bring 1-2 pre-sewn muslins and their patterns for alterations. Click Here for more information. Lunch and refreshments. Pattern paper, paper scissors, scotch tape, pencil, carbon paper, twill tape, french curve rulers, drafting L square rulers. Sewing machine and sewing supplies, 3-4 yards muslin, dual tracing wheel, pencil, 1 yard of 1/4 or 3/8 inch elastic. Kenneth is a professor at F.I.T. (Fashion Institute of Technology) in New York and the Sewing and Design School. Kenneth won the Association of Sewing and Design Professional's 2013 Lifetime Achievement Award. He is known for his articles in Threads Magazine, his books, CD books, TV show (â€œSewing Todayâ€), and "Jean-ius" an online class at www.craftys.com , as well as his excellent teaching skills and his dashing personal style. He teaches workshops in Moulage, a French method of drafting and constructing a body double and bodice, jacket and overcoat slopers, Sleeve Drafting, Trouser Drafting, Designer Techniques, Cloning your Favorite Garments, leather and fur construction techniques and countless other techniques. Contact Kenneth directly at kennethdking@earthlink.net or visit www.kennethdking.com.